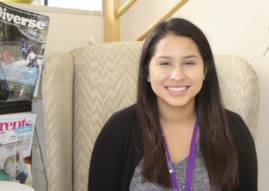 Analysa Castillo treats everyone at the college, and particularly in our office suite, as if they are a part of [the] family. Not only does she do her job with efficiency and integrity, she also finds the time to encourage others through a gesture or note. Analysa treats everyone (students, parents, staff, faculty, administrators, and community members) who comes by or calls with professionalism and sincerity. Analysa finds the resources to complete every job on time or ahead of time. She anticipates work without being prompted and double checks everything for accuracy. She operates at a very high level, thinking on multiple levels at once to anticipate challenges to new processes and procedures before they are implemented. You did it! Congratulations!!! So proud of you!!! You Go Girl! !